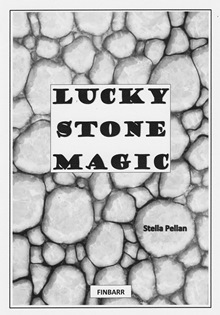 Lucky Stone Magic Helped Me Pay My Debts and Brought Me True Love  declares author Stella Pellan in her booklet Lucky Stone Magic. She had always been fascinated by precious stones but had never tried magic with them for everything she had read on the subject had only left her confused and bewildered. But then an amazing dream prompted her to look at her stones in a new light. It was then that the magic began to happen, she says. She had been depressed by a messy divorce and the sudden death of her mother. She was in debt and was drinking heavily. It all began to change within a few weeks. She stopped drinking. Dead cold. Without will power. I couldnt believe it! And that was only the beginning, she says. Later it brought her the man of her dreams. Lucky stone magic also enabled him to quit smoking and pass his driving test after failing six times. Lucky stone magic is so simple, she says. And if you cant afford the modest cost of a precious stone an ordinary common stone from the ground will do, she says. It is easy as 1-2-3 and enjoyable too.